Nothing says Christmas like a beautifully-lit home and, for many, Christmas lights make a big difference in your holiday experience. From incandescent lights to LEDs, there are a variety of lighting options that will suit your preferences and needs. To help you decide which lights are right for you, here are brief descriptions of each lighting option. Incandescent bulbs have comforted us for many Christmas seasons. Loved for their warm, yellowish light, they provide a traditional ambiance and a relaxing sense of familiarity to our favorite holiday. Incandescent bulbs are very affordable. When they burn out or if they get damaged, replacement is usually not a hassle or expensive. There is also a wide variety of sizes and colors of bulbs you can choose from. C7 bulbs (2 inches long) are ideal to outline the yard, while C9 bulbs (3 inches long) are usually suspended on rooftops and wrapped around large outdoor trees. Their surfaces are sometimes coated with patterns and designs in bright, translucent paint for a more cheerful glow. And since they screw into individual sockets, you have the option to create a sequence of colored lights to your liking. Although priced less than LEDs, incandescent bulbs can lead to a high electric bill because of their inefficiency. Only around 5% of the power they consume is converted into light, while the remaining 95% is converted into heat. This not only makes them expensive in the long run, but potential fire hazards due to overheating. Finally, extra care in handling must be taken as they are made with fragile materials such as glass and filament. Due to significant advances made over the last few years, more and more consumers are switching from incandescent to LED bulbs. 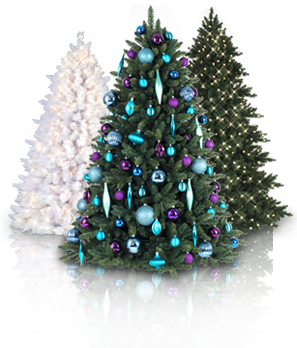 Christmas LED lights come in a wide range of colors and present a myriad of advantages. LEDs help save on electricity costs. Made from energy-efficient materials, they consume less power than incandescent bulbs. The brightness of a 60W incandescent is comparable to an 8W to 12W LED bulb. That said, this makes their lifespan quite impressive as well. LED Christmas lights can last for about ten seasons with proper care and storage. Durable and versatile, the lights are usually encased in plastic and can be used both indoors and outdoors. They also have built-in fuses to protect against overheating, ensuring that your displays are safe and enjoyable for many years. Aside from these technical advantages, LED bulbs are a popular Christmas lighting option because of their festive colors. Available in clear, single-colored, and multi-colored options, these bulbs make your display more fun and exciting to decorate. LEDs should be seen as an investment. While you can save electricity in the long run, they are more expensive to buy and replace than incandescent bulbs. Thus, wrapping your large outdoor tree with several strings of these may not be the most practical option. In addition to being pricey upfront, some LEDs emit strong light that can be too bright for some people. One solution to this is by dimming them, but not all LEDs work with dimmer switches. In selecting the perfect Christmas lighting for your home, consider what complements your décor, where you will display the lights, what light fixtures you have, and what your budget is. Most people mix incandescent bulbs with LEDs because each type has its own benefits and uses. Whether you prefer to mix or match, festive Christmas light displays will always be the center of every holiday season.